3. You accept that Our Site is provided “as is”. 4. YOUR ACCESS TO AND USE OF OUR SITE MAY BE TERMINATED AT ANY TIME FOR ANY REASON OR FOR NO REASON BY YOU OR BY US BY THE SENDING OF NOTICE TO THE OTHER PARTY. 5. As you access our site, we may collect and transmit data obtained from and about you for marketing purposes. 6. You may not copy, distribute, republish or upload any of the material which is located on our Site without our prior consent in writing. No intellectual property or other rights shall be transferred to you. 7. WE EXCLUDE ANY AND ALL LIABILITY FOR ANY LOSSES AND EXPENSES OF WHATEVER NATURE, INCLUDING WITHOUT LIMITATION ANY DIRECT, INDIRECT, PUNITIVE, SPECIAL, OR CONSEQUENTIAL DAMAGES, LOSS OF USE, LOSS OF DATA, LOSS CAUSED BY A VIRUS, LOSS OF INCOME, DAMAGE TO PROPERTY, CLAIMS OF THIRD PARTIES, OR OTHER LOSSES OF ANY KIND OR CHARACTER, EVEN IF WE HAVE BEEN ADVISED OF THE POSSIBILITY OF SUCH DAMAGES OR LOSSES, THAT ARISE OUT OF OR IN CONNECTION WITH THE USE OF THIS OUR SITE OR ANY WEB SITE WITH WHICH IT IS LINKED. YOU ASSUME TOTAL RESPONSIBILITY FOR ESTABLISHING SUCH PROCEDURES FOR DATA BACK UP AND VIRUS CHECKING AS YOU CONSIDER NECESSARY. 8. Where we provide links to other sites, such as Facebook, we do so for information purposes only. Such links are not endorsements by us of any products or services in such sites. 11. This Agreement is governed by the laws of the State of New York, without regard to principles of conflict of laws. 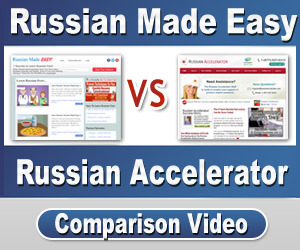 To the extent you have in any manner violated or threatened to violate the intellectual property rights of RussianMadeEasy.com, we may seek injunction or other appropriate relief in any state or federal court in the State of New York, and you consent to exclusive jurisdiction and venue in such courts. If a dispute arises under this agreement, we agree to first try to resolve it with the help of a mutually agreed-upon mediator in the following location: Westchester County. Any costs and fees other than attorney fees associated with the mediation will be shared equally by each of us. If it proves impossible to arrive at a mutually satisfactory solution through mediation, we agree to submit the dispute to binding arbitration at the following location: Westchester County under the rules of the American Arbitration Association. Judgment upon the award rendered by the arbitration may be entered in any court with jurisdiction to do so.